Seek medical attention. You do not know whether or not the animal has been vaccinated against rabies. Rabies is a very serious virus. If the dog that bit you isn’t up-to-date on shots, it is likely you will have to go through a painful serious of rabies shots. Even if the animal is up-to-date, you are still at risk for infection if the wound is not treated properly. In addition, it is important that a medical professional documents your injuries. Report the incident to the proper authorities as soon as possible. You should contact 911 and/or Chesapeake Animal Services Unit (757-382-8080). It is important that the incident is documented by authorities and witness information is collected. The animal may also need to be quarantined and observed for rabies. Take photos of your injuries as soon as possible, and continue to take photos during the healing process. Photos of your injuries can be very valuable evidence for your case. Contact an experienced Virginia dog bite lawyer to help you get the best possible settlement. Loss of Earnings: You may be entitled to recover for the loss of earnings which you suffered from your injuries. This includes wages, commissions, bonuses, and all other earnings and fringe beneﬁts. If you are not able to work presently because you are recovering from your injuries, the loss of income should be made up. Disﬁgurement: If the injury causes scarring or other unsightly marks, the victim may be entitled to recover for the disﬁgurement. Because these injuries are often in very visible places, victims are often very self-conscious of their appearance. Medical Expenses: Damages may include any sort of medical expenses that a victim has had to pay for at a hospital, clinic, or to a pharmacy. These include the cost of basic medical treatment, going to the emergency room, and any sort of surgical treatment or care needed to repair the damaged area of the body. Dogs are required to stay in their own yard unless accompanied by an owner or another individual. Dogs and cats must be restrained by a collar and on a leash when not in their own yard. Any dog that bites or scratches a human is required to be quarantined for a period of 10 days. Chesapeake Animal Control is responsible for overseeing this activity. An owner who fails to comply with this law can face criminal charges. 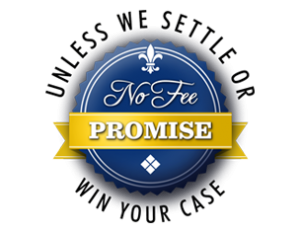 The Law Offices of Richard J. Serpe, PC offer a No Fee Promise, which means that you don’t owe us any legal fees unless we settle or win your case. We will work on your behalf to get a fair settlement, and only charge legal fees if you receive a settlement or verdict.